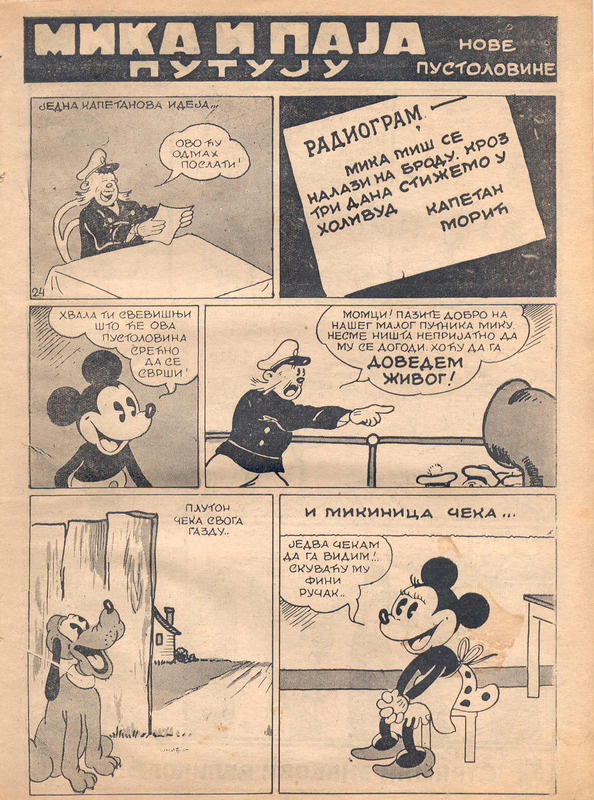 British comics artist Basil Reynolds' Captain character from his (non-Disneyic) 'Skit, Skat and the Captain' series which he drew for Britain's Mickey Mouse Weekly between 1936-1940 had made a cameo appearance in a Yugoslavian Mickey Mouse comics published in 1936: He appears in the 25th part (see above scan, taken from outducks archive) of the 'Donald & Mickey - A Trip: New Adventures' serialized in Mika Mis no. 's 32-56. Reynolds' Captain's cameo in this Yugoslavian comics was first noticed by inducks indexer Mankkop in 2010. 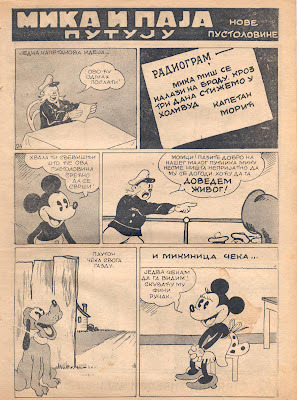 Actually, 'Donald & Mickey - A Trip: New Adventures', probably drawn by Yugoslavian comics artist Vlastimir Belkic, utilizes even more material from from MMW: For instance, the sea dragon which appears in part 4 is traced from a non-Disneyic gag, probably again the work of Reynolds, in MMW no. 4 and the tiger in part 19 from the 'Ted Towers' comics, of US origin, serialized in the early issues of MMW; I am sure that a patient examination would lead to identifying most of the figures in most of the panels to be traced from somewhere in MMW.